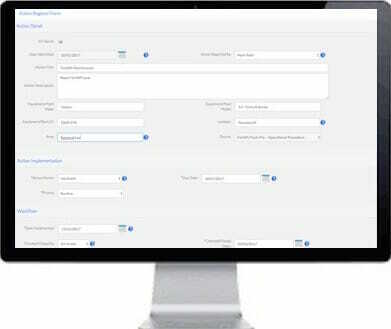 The DIGI CLIP Action Register tracks and communicates the workflows of required actions. Actions are added to the Action Register from DIGI CLIP mobile forms, the Safety Tracker incident and hazard management software and manually. Actions can be made re-occurring, or scheduled as a future event. With the Digi Clip Action Register never miss a deadline again! The automated email functionality allows selected stakeholders within an organisation to receive emails when an action is added to the Action Register, nearing the required completion date, overdue, implemented and closed-out. Further, to complete the workflow cycle of a required action an email is sent to the email address of the person that initially reported the fault or defect once the action is closed-out. The DIGI CLIP Action Register tracks and communicates the workflow of required actions, and allows for documents to be uploaded that support the workflow of actions. The Action Register is ideal for organisations that get audited and require evidence of compliance. The Action Register reduces the costs associated with maintaining your vehicles, equipment and facilities. On road vehicle and equipment breakdowns are costly and reduce the efficiency of organisations. Having full visibility on what repairs or maintenance have been completed and closed-out will provide peace of mind and increase vehicle and equipment uptime.